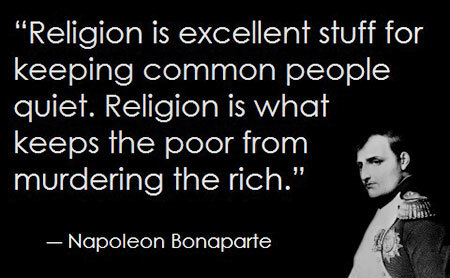 Religion is most definitely used to maintain order in a society. that predates his rule altogether? The Christian faith is the result of the most successful psy-ops program in history, according to a self-professed American Bible scholar. Joseph Atwill will present his controversial theory Oct. 19 in London that the New Testament was written by first-century Roman aristocrats as part of a sophisticated government project to help pacify Jews in occupied territories. Atwill, author of "Caesar’s Messiah," claims he’s found ancient confessions by the scriptures’ authors that they invented Jesus Christ and his story as basically a form of propaganda. "Jewish sects in Palestine at the time, who were waiting for a prophesied warrior Messiah, were a constant source of violent insurrection during the first century," Atwill said. "When the Romans had exhausted conventional means of quashing rebellion, they switched to psychological warfare. They surmised that the way to stop the spread of zealous Jewish missionary activity was to create a competing belief system. That’s when the ‘peaceful’ Messiah story was invented. Instead of inspiring warfare, this Messiah urged turn-the-other-cheek pacifism and encouraged Jews to ‘give onto Caesar’ and pay their taxes to Rome." He says that Jesus was not based on an actual historical figure, but Atwill argues that the events of his life were overlaid on top of actual events from the First Jewish-Roman War, waged by Emperor Titus Flavius in Palestinian territories. "The biography of Jesus is actually constructed, tip to stern, on prior stories, but especially on the biography of a Roman Caesar," he says. religious studies book "Caesar's Messiah" by Joseph Atwill. who left us documents to prove it. 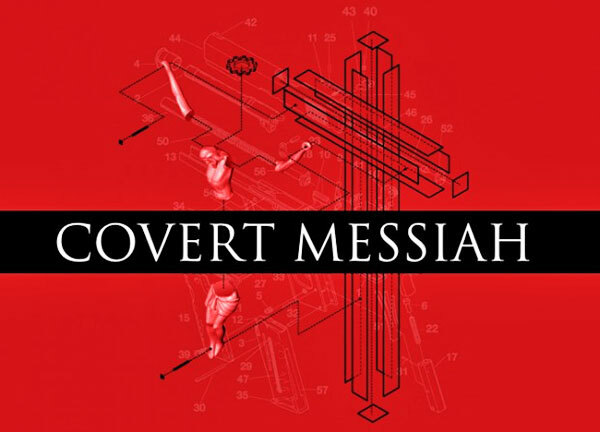 Atwill said he understands that his theory is bound to upset Christians, and he’s hoping skeptics will come to challenge him after his lecture as part of a symposium, "Covert Messiah," along with Kenneth Humphreys, author of "Jesus Never Existed." "Although Christianity can be a comfort to some, it can also be very damaging and repressive, an insidious form of mind control that has led to blind acceptance of serfdom, poverty, and war throughout history," Atwill says. "To this day, especially in the United States, it is used to create support for war in the Middle East." other stories for an ancient Roman propaganda campaign? whose entire life story can be traced to other sources. to present this controversial discovery to the British public. ancient confessions recently uncovered now prove, according to Atwill, that the New Testament was written by first-century Roman aristocrats and that they fabricated the entire story of Jesus Christ. His presentation will be part of a one-day symposium entitled "Covert Messiah" at Conway Hall in Holborn. Full details here. Although to many scholars his theory seems outlandish, and is sure to upset some believers, Atwill regards his evidence as conclusive and is confident its acceptance is only a matter of time. "I present my work with some ambivalence, as I do not want to directly cause Christians any harm," he acknowledges, "but this is important for our culture. Alert citizens need to know the truth about our past so we can understand how and why governments create false histories and false gods. They often do it to obtain a social order that is against the best interests of the common people." Atwill asserts that Christianity did not really begin as a religion, but a sophisticated government project, a kind of propaganda exercise used to pacify the subjects of the Roman Empire. "Jewish sects in Palestine at the time, who were waiting for a prophesied warrior Messiah, were a constant source of violent insurrection during the first century," he explains. That's when the 'peaceful' Messiah story was invented. Instead of inspiring warfare, this Messiah urged turn-the-other-cheek pacifism and encouraged Jews to 'give onto Caesar' and pay their taxes to Rome." Was Jesus based on a real person from history? "The short answer is no," Atwill insists, "in fact he may be the only fictional character in literature whose entire life story can be traced to other sources. Once those sources are all laid bare, there's simply nothing left." Atwill's most intriguing discovery came to him while he was studying "Wars of the Jews" by Josephus [the only surviving first-person historical account of first-century Judea] alongside the New Testament. "I started to notice a sequence of parallels between the two texts," he recounts. "Although it's been recognized by Christian scholars for centuries that the prophesies of Jesus appear to be fulfilled by what Josephus wrote about in the First Jewish-Roman war, I was seeing dozens more. What seems to have eluded many scholars is that the sequence of events and locations of Jesus ministry are more or less the same as the sequence of events and locations of the military campaign of [Emperor] Titus Flavius as described by Josephus. This is clear evidence of a deliberately constructed pattern. The biography of Jesus is actually constructed, tip to stern, on prior stories, but especially on the biography of a Roman Caesar." How could this go unnoticed in the most scrutinized books of all time? "Many of the parallels are conceptual or poetic, so they aren't all immediately obvious. After all, the authors did not want the average believer to see what they were doing, but they did want the alert reader to see it. 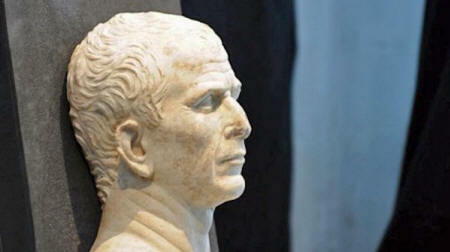 An educated Roman in the ruling class would probably have recognized the literary game being played." "the Roman Caesars left us a kind of puzzle literature that was meant to be solved by future generations, and the solution to that puzzle is 'We invented Jesus Christ, and we're proud of it.'" Is this the beginning of the end of Christianity? "Probably not," grants Atwill, "but what my work has done is give permission to many of those ready to leave the religion to make a clean break. We've got the evidence now to show exactly where the story of Jesus came from. Although Christianity can be a comfort to some, it can also be very damaging and repressive, an insidious form of mind control that has led to blind acceptance of serfdom, poverty, and war throughout history. To this day, especially in the United States, it is used to create support for war in the Middle East." Atwill encourages skeptics to challenge him at Conway Hall, where after the presentations there is likely to be a lively Q&A session. Joining Mr. Atwill will be fellow scholar Kenneth Humphreys, author of the book "Jesus Never Existed."